Fifa has given Swiss investigators access to the emails of the organisation's suspended general secretary Jerome Valcke. 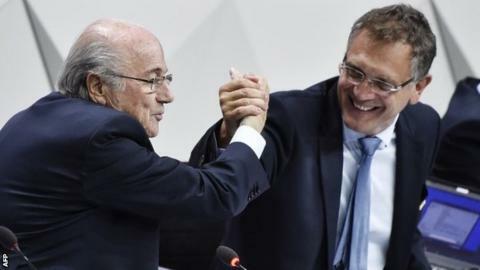 Newspaper allegations implicated Valcke, 54, in a scheme to sell World Cup tickets for above face value. Valcke, who describes the allegations as "fabricated", has been released from his duties pending an investigation. His emails since May 2015 have been handed over, said the office of Switzerland's attorney general (OAG). Investigators will also be given access to older emails sent by Valcke, who has held his role at Fifa since 2007. World football's governing body has been engulfed by claims of widespread corruption since May, when Swiss police raided a hotel in Zurich and arrested seven of its top executives. United States officials have since indicted those seven and two other Fifa officials on bribery and racketeering charges. President Sepp Blatter announced he would stand down just days after winning re-election in June. The 79-year-old and his executive committee are meeting in Zurich. Valcke, Blatter's number two, faces a formal investigation by the Fifa ethics committee. The Swiss attorney general said last week his office had conducted house searches in western Switzerland and seized apartments in the mountains that may have been used to launder money. Blatter has urged Fifa to support American and Swiss investigations into allegations of corruption in football. "We should co-operate, no matter how close to home those investigations get," wrote Blatter in his weekly Fifa magazine column. "This is the difficult path we must follow if we are serious about change. "We need to show that we understand the severity of this situation and that we are ready to take the right steps to fix it."